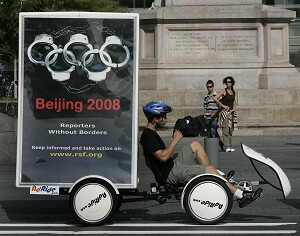 NEW YORK—In less than 30 days, Beijing will kick off its opening ceremonies for the 2008 Olympics. While China prepares for its appearance on the world's center stage, the Tibetans, Uighurs, Falun Gong practitioners, and political dissidents of China will undoubtedly suffer 30 days of persecution and oppression. These groups who are denied rights by the Chinese regime cannot have their voices heard in China. But here in America, where freedom of speech is not muffled, protests and calls for human rights have strengthened recently as the start of Beijing '08 draws closer. Eight is generally considered a lucky number in Chinese culture, but members of the “POC 8″—eight select prisoners of conscience in China—can't exactly consider themselves lucky. The POC 8, which according to Reporters Without Borders, includes Huang Qi, Sun Lin, Qi Chonghuai, Hu Jia, Yang Chunlin, Chen Guangcheng, Shi Tao and Yang Zili, were the highlight of a July 8 global appeal for their release. Representatives of Reporters Without Borders, Initiatives for China, and New York officials gathered at New York's City Hall Tuesday to speak out for the POC 8 and to call for their release. According to Baiqiao Tang, Tiananmen survivor and director of China Peace and Democracy Federation, there are documented 732 political prisoners in China right now. But that number is nowhere near the real number. Prominent Tiananmen Square activist Jianli Yang experienced first-hand being locked away in a Chinese prison, and was released only last year. “Since my release, I cannot forget for one second the thousands and thousands of political prisoners I have left behind,” Yang said. Yang told the story of Bingjiang Wang, another political prisoner who is the founder of the overseas Chinese democracy movement and was abducted in 2006. He was held for six months before his arrest was even announced. He was later sentenced to life in prison. While Chinese officials are keeping political dissidents in jail, Chinese police are busy rounding up Falun Gong practitioners and transporting them to labor camps, sometimes without trial. According to the Falun Dafa Information Center (FDIC), more than 200 Falun Gong adherents have been arrested in Beijing alone, and more than 30 have already been sentenced to “re-education through labor” camps without trial. Labor camp sentences are lasting up to two and a half years. Chinese police are conducting not only warrant-less, door-to-door arrests, but are also targeting areas where Olympic events are being held, such as in Beijing's Chaoyang District, which hosts soccer and swimming events, and Haidian District, which hosts basketball and volleyball events. The arrested are then often sentenced in sham trials, and families are notified months after the sentence. The crackdown on Tibet by the Chinese communist regime also intensified recently as more than 1,000 Tibetan monks were arrested and detained to suppress potential protests during the Olympics. The organization Students for a Free Tibet and its sources in eastern Tibet confirmed that three central monasteries around Lhasa, the capital of Tibet, were emptied and the monks sent either 600 miles away to Gormo or even further to Xining on the Eastern Tibetan border. The British newspaper The Times reported that the monks that were taken into custody will be released after the Beijing Olympic Games. The arrests of Tibetan monks follows the slew of recent events involving the Chinese regime tightening their iron fist on the autonomous region. In March, Tibetan protests turned violent. Dozens of deaths were reported after the Chinese military brought Lhasa and other parts of Tibet under martial law. They continued that stratagem two weeks ago when Chinese troops inundated the streets of Lhasa while the Olympic torch was paraded through Tibet. The press conference at New York's City Hall included Tibetan activists, such as Phurdu Dorjee. Dorjee is a native Tibetan who has seen the Chinese Communist Party constantly tyrannize his homeland and his people. Calls for the Bush administration and the international community to condemn these actions have largely been ignored. “We are extremely disappointed that President Bush and other world leaders are turning a blind eye to the suffering of the Tibetan people and are attending the Olympics opening ceremonies,” said Han Shan, Olympics Campaign Coordinator for Students for a Free Tibet. When Beijing won the rights to host the 2008 Olympics in 2001, the Chinese government made a promise to the International Olympic Committee and the international community to concretely improve human rights. But those promises have for the most part been empty. “We've been waiting for the improvement of human rights we've been promised. We've been waiting for the complete freedom of the press we've been promised,” said Morillon, of Reporters Without Borders. It is for that reason that the outside world must look through the mask that China has put on and persevere in demanding rights, said Jeremy Taylor, host of the cable show Step Up.